Yesterday evening, May 28, the ES season 2018 for my QTH was started. 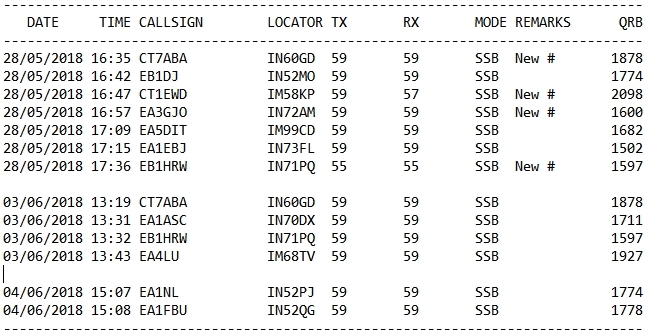 Within a good hour, 2x CT and 5x EA stations found their way to the log. The signals were not very loud and could only be heard very briefly, usually not longer than a minute. Nevertheless, it was long enough for 4 new QTH Locator and an ODX of 2.098 km. More informations about this opening are here. This event was followed by two further short ES openings on the 3rd and 4th of June. This entry was posted in VUSHF and tagged ES, VUSHF by dk5ai. Bookmark the permalink.